The first coin pictured on the page fits best to position 214 inside catalogue Monede şi bancnote româneşti. 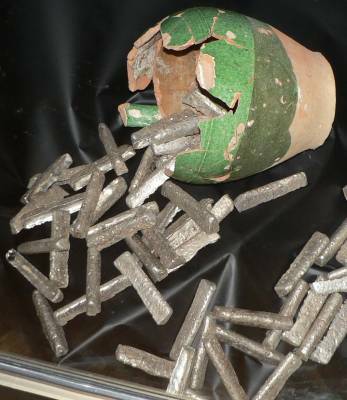 Some regions were the coin most probably welded together with others in the same hoard are kind of slightly guessed. He ruled Moldavia between 1375 and 1392 and is the first voivod known to have struck coin. His surname is Muşat for his mother Muşata (in Latin called Margareta), thought to be the daughter of Bogdan the Founder. During his reign Moldavia became a both important and stable state, reaching its natural borders at the Black Sea, comprising the White Fortress (Cetatea Albă in Romanian, Asprokastron in Greek, i.e. the ancient sea harbour of Tyras next to the mouth of river Nistru). The more remarkable his work is remembering the principality was founded only in 1353, achieving independence in 1359. It is supposed, with good reason, that the reverse shield is the personal coat of arms of the Muşatin reigning family. If this allegation is true, then it must be remarked that this coat did not have a fixed form, the number of the fleurs-de-lis in its second field varying sensibly without any possible reasonable heraldic explanation. 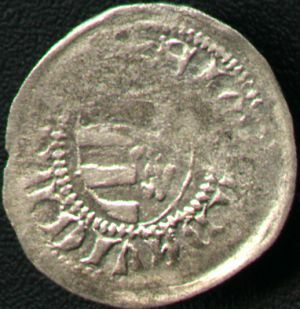 The number of the fleurs-de-lis varies for the coins of Peter I Muşat from two to seven. The variation carries on for his succesors also. Peter I established strong relations with Walachia and Poland. As formally recognizing Polish suzerainty, he got to marry a cousin or maybe a sister of the Pole king Vladislav Jagello. He is known to have eased a political treaty for Mircea the Old of Walachia with Poland. Moldavia reached a richer and richer state of wealth in his period. In 1388 Petru was able to lend the king of Poland the sum of 3.000 "French" silver rubles, a huge amount of money for the time, equivalent to 538.38 kg of fine siver or to 51.817 (almost fifty two) kg of pure gold. The sum could be translated into 14.531 golden Venetian ducats. As security for the contract he received as pledge the province of Pocutia, a region of about 8.000 square kilometers north of Moldavia. He obtained possession de jure and de facto of the estate shortly before passing away, in 1392, according to the written provisions, as the Poles were not capable of returning the money. Pocutia was an ever disputing apple of discord between Moldavia and Poland up to the end of the 16th century, the Polish rulers never missing any occasion of demanding for the original document of the contract to be returned to their hands. Istoria românilor by Constantin Giurescu points that the origin of the Moldavian monetary system is to be sought in the adaptation of a unit called sommo. This unit weighed 206.5 grams and was used by the Italian Black Sea commercial colonies of Licostomo (the later Chilia Veche in the Danube's Delta) and Caffa (north of the Sea). It is thought that the unit of sommo was used for striking 200 groses, so that we infer the Moldavians lightened slightly the original mass, the average weight of a gros being 0.97 grams. SI(gnum) M(onetae) PETRI WOIWO(dae) and SI(gillu)M PETRI WOIWO(dae). SI(gillum) MOLDAVIENSI(s) means Seal of Moldavia. 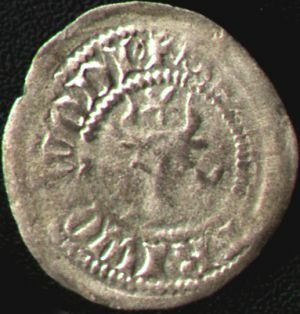 The first medieval silver gros was bought from Mr. Balazs Aldor, a good friend of Romanian coins. The second row of pictures are present on the site through the kind permission of Mr. Adrian Popovici.